Standing along the Snake River in Grand Teton National Park I was in awe. The colors, textures, and light that was unfolding in front of my camera was a truly magical experience. 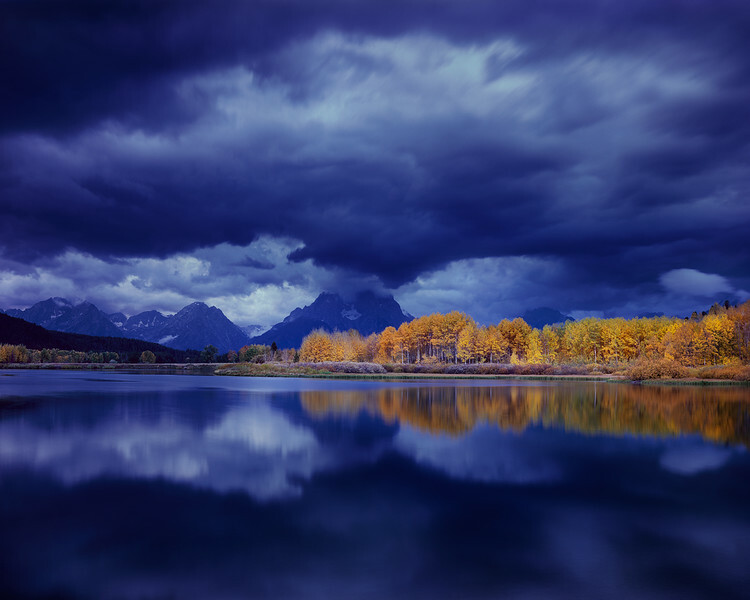 The light continued to shift and change highlighting the grove of aspens reflecting their color into the Snake River, the clouds appeared to roar across the sky creating the drama I have dreamed about for years. Standing behind my large format view camera I was in shock as this once in a lifetime scene presented itself. In order to capture the drama I was required to expose my film for 2 minutes, which can be very nerve racking. If I had bumped my tripod it would have resulted in a blurry mess on my film. While exposing the film I was a total wreak, I wanted to pace along the river as I waited, but was forced to stand as still as possible not touching the tripod or even shifting the sand beneath my feet, breathing was another challenge as it felt like I held my breath for the entire two minutes. All of nerves were felt up until I got my developed film back from my lab, tossing the film on the light table I was in shock yet again as I created and captured a photograph that I finally felt was deserving of this very special release. Viewing "TWO" I hope you can feel the excitement I felt while standing along the river exposing the film as this photograph represents everything I have worked for over the past 18 years as a photographer.